A ginger beer a day keeps the evils away. And the doctors. When we traveled through Sri Lanka we grew addicted to this spicy drink, chock full of full-fledged ginger flavor and the secrets of Ayurvedic healing. 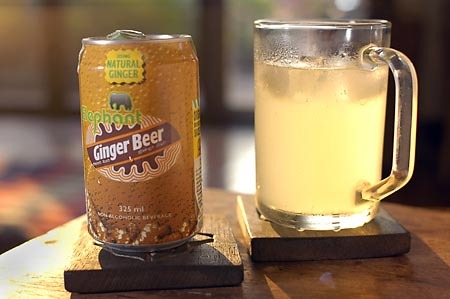 Ginger beer is not ginger ale; it’s health and energy in a can (or bottle). Elephant isn’t the only brand sold in Sri Lanka, but it’s the only brand of Sri Lankan ginger beer I’ve found here in Chiang Mai (at Kasem). This is the perfect time of year to take advantage of Ayurvedic wisdom and drink your ginger, particularly if you live in cold climes. There was another drink we consumed with regularity in Sri Lanka, and I confess I have forgotten its name. It, too, was a zippy Ayurvedic healing drink with ginger, peppercorns and a host of spices. We usually found it in dusty brown bottles sold at little hole-in-the-wall cafÃ©s. I’ve searched for a reference, and the closest I’ve come is a recipe for panakam, which is easily made at home. Panakam is a cooling drink in South Asia. But its medicinal properties, which combat stomach ailments and sore throats, would seem to make it an ideal drink during the northern flu season as well. Oh goodness, that looks fantastic. I could have used many glasses of that last week — you are right! Thank you for all your writing here. I’m constantly amazed, even if I don’t comment enough. John is also a huge fan of Ginger Beer- ginger anything actually, we usually get Reed’s Extra Ginger Beer- a US variety that I am sure is not as flavorful as what you find but the other day I picked up a bottle at the local grocery store that was quite different- it was in their United Kingdom section-Belvoir farms Organic. The initial taste was light and flowerey(not sure this is a word but hope you will understand what I mean) and then it just burned all the way down. I think it was even a bit spicy for John- which never seems to happen. Good to Know that we can now consider ginger beer drinking as good for our health- not just a tasty treat! Mmmmmm ginger! Ginger is good for all tummy ailments! I still have a can of the super ginger juice that the Queen “makes” there in Thailand. Unfortunately, I can never find similar things here at the Asian market so I settle for eating the uncrystalized candied ginger I can find. That’s good to tho.